The Ghana Ports and Harbours Authority (GPHA) and its allied agencies and companies have concluded a week-long trade mission to Burkinabe capital, Ouagadougou. 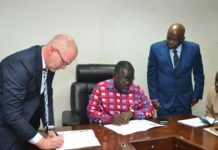 The trade mission was organised as part of the Acting Director General of GPHA, Paul Asare Ansah’s initiatives aimed at attracting the transit business to the country’s ports in line with its repositioning to become the trade hub of the sub-region. The delegation was led by the Board Chairman of GPHA, Peter Mac Manu and comprised the Acting Director General of Ghana GPHA, Paul Asare Ansah, the Chief Executive officer of Ghana Shippers Authority, Benonita Bismarck, Director of Tema Port, Edward Osei, General Manager of Corporate Affairs and Marketing of GPHA, Esther Gyebi-Donkor and other managers of Ghana Ports and Harbours Authority, Terminal operators and service providers at Ghana’s Ports. 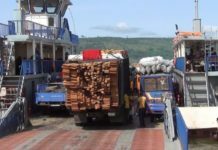 The GPHA believes that by embarking on the trade mission, it will be able to increase its transit traffic significantly in 2018 and the years ahead. The business delegation paid one-on-one visit to major importers and exporters in Burkina Faso like Grand Moullins/Rimonhajjar Enterprises, importers of bulk flour. Board Chairman of the GPHA, Peter Mac Manu, told the importers that they had come to listen and find solutions so that the business between Ghana and Burkina Faso would grow and continue to grow. At SITAP, the leading importer of steel and coils in Burkina Faso, the Chairman of the Company was full of praises for the significant strides being made at the country’s ports to enhance trade facilitation. He assured that, he will personally encourage other leading importers in Mali and Niger to use Ghana’s Ports. He also encouraged Ghana’s Ports to seize the opportunity and capture the exportation of cotton in Burkina Faso since that country is the leading producer of cotton in Africa. “90% of our cotton used to go to Tema port in the years 2004 and2005. You would have to look at your taxes again so capture the hearts of the importers,” he said. The delegation also called on Kanis Commodities owners of CIMFASO, cement producing company and an importer of bulk rice and clinker. 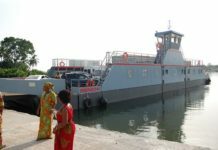 Kanis rated Ghana’s ports for being customer friendly and assured that they will continue to use Ghana’s Ports. “We are considering importing our goods either through Tema or Takoradi for our industrial sector”, the representative of Kanis expressed. The delegation also met the Transport Association of Burkina Faso called OTRAF. The OTRAF members had a number of concerns including the illegal charging of 10,000 CFA by agents or goro boys at the borders of Ghana. One of the OTRAF members lamented that “at Paga, any truck passing by has to pay 10,000 CFA”. The Director General of GPHA, Paul Asare Ansah, assured them that he will petition Customs on their behalf for that activity to be scrapped. The delegation then met with the Customs of Burkina Faso where the Commissioner of the Burkinabe Customs requested for a lot more integration and coordination with the Ghana’s Customs. He also requested that Ghana considers some of its border procedures as some of them appear repetitive. “So we should be able to integrate all that and adapt procedures which could facilitate, and simplify our procedures,” he requested. 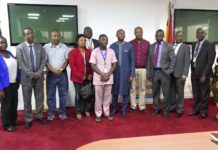 The delegation also met the Burkina Shippers Authority Council where some concerns were tabled for Ghana to consider including a plea for Customs to review the 7-day free period transit truck can stay on the corridors of Ghana after which they are charged 1,000 penalty for over stay. 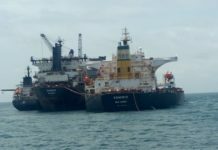 General Manager of Corporate Affairs and Marketing of GPHA, who is also in charge of the transit trade in the Port, Esther Gyebi-Donkor assured them that the Port Authority will consider their concerns. “Since last year September when we started the terminal, the transit operators don’t pay any money to MPS. They pay only to the Port Authority. So the double handling payment has become one. So if our importers and our exporters here are not having that impact, then it means that our clearing and forwarding agents who are representing them are not telling them something,” Mrs. Gyebi-Donkor explained. The business delegation, met the Burkinabe Ministries of Trade as well as Transport, Chamber of Commerce and called on the Ghana embassy of Burkina Faso where the delegation was advised on ensuring that transit documents at Ghana’s Ports are less complicated.